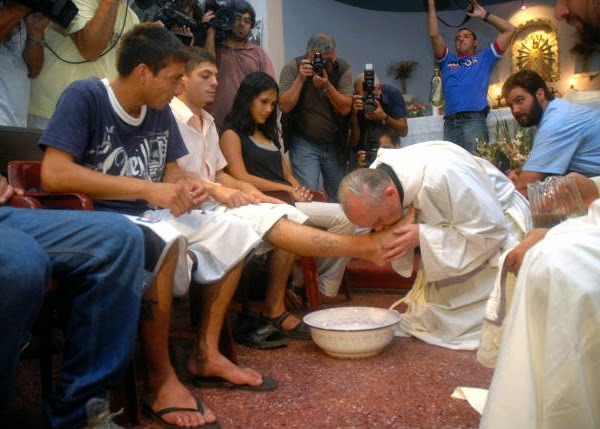 Unam Sanctam Catholicam: Foot Washing: What's the big deal? Anon, sorry, I accidentally deleted your comment! But what he said was what will a Muslim think by the Pope washing his feet. Could it perhaps signify to him that Christians will bow and serve Allah? Will it confirm a Muslim in his faith? Thank you for this column, Boniface. It should be spread far and wide. Only God knows how much progressive buffoonery is going to be rationalized in "the spirit of Pope Francis" over the next century. I've been very critical of Pope Francis's pontificate, but let's be clear on this one - the same people who are railing against the Pope for washing the feet of prisoners are the SAME people who are railing against him for condemning the death penalty. The connection is clear. Please be clear. Are you trying to suggest that the "connection" is that these critics just dislike prisoners and don't want any gestures of clemency towards people in prison? If so, that's no "connection" at all. I have made it very clear that this isn't some elitist complaint about "Ew...the pope shouldn't be dealing with prisoners!" The death penalty thing is related to this issue, but in another way - in both cases, we have the pope simply disregarding the directives of the Church. The traditional venue for the pope's Holy Thursday Mass of The Lord's supper is not St. Peter's Basilica but the Archbasilica of St. John Lateran, the cathedral,of the Diocese of Rome. You know I don't know if that's right or not, but of course it depends on how "traditional" you want to get. I did some research on this before I wrote and it appears that JPII and BXVI used to wash in St. Peter's, even though obviously the Lateran is their cathedral church. I could not find any reference to St John Lateran. Can you find a reference? But, Boniface, might it be the case that the Holy Father is INTENDING to "break the law"? You know - the old liberalist mantra: "the law is bad, and only the spirit is good" agenda. Perhaps, that is why he seems willing to forgo the law to such a degree which scandalizes us "trads"? Quovadis, I think that is clearly understood. The only other possibility is that he is ignorant of the very existence of the law, which I cannot imagine to be the case. More likely than not he sees the law as a mere guideline that has to give way before the "needs" of the contemporary situation. You know, even the Neo-Cats will reach a point where something is changed and a novelty is put in the place of that which was changed and they will say, Hey, that's not right. I know. What the Holy Father has been doing makes very little sense. Boniface, regarding the appropriate "venue" for Holy Thursday: It is St. Saviour in the Lateran because that is the Stational Church for the day. It may well be that it is the Stational Church for the day because of the nature of Holy Thursday, but the appropriate venue is in virtue of its being the Stational Church. In what fantasy land can a Muslim or atheist in any way represent the Church? Dare I say it - in V II land?